New e-mail Sign-Up Option for Target Cartwheel! 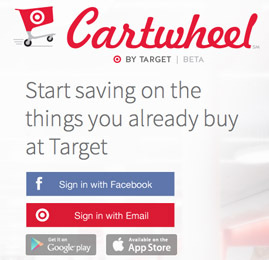 Cartwheel is now offering the option to login or sign up with email! Keep in mind though, Cartwheel’s sign in feature is currently in testing and your account may be temporarily unavailable as they work out the details. If you do sign up, you can provide valuable feedback while they are testing by going HERE. This new feature is good news for those of you who have not yet signed up for Cartwheel or do not use Facebook. You can now take advantage of the great discount offers Cartwheel has to offer. Just go HERE to sign up. You can also check out my post HERE for more info and tips on how Cartwheel works. For those of you who currently have cartwheel, they are still working on tying or syncing your Cartwheel/Facebook profile with your Cartwheel/Email profile. This means that if you login to Cartwheel now thru your email, none of your cartwheel bonuses or other information will transfer over. Essentially, you would be starting with a clean slate. You may want to wait until they have finished setting up this feature so you don’t lose anything. I have accumulated several bonuses so I think I will wait as they continue testing. We will keep you up to date on Cartwheel changes as they become available. You can also check out their Updates Page for current news on Cartwheel. -Thanks so much for the heads up to Casey & Kyle! This is great news! I just signed up with my email address. Also my fabulous husband just let me know this morning that he has been getting the Target mobile coupons too on his phone. Hello! I freaked out at that so now I am even beaming more that I can save with Cartwheel too. Target mobile coupons or Target online coupons with Cartwheel with mfr. coupons with Shopkick!!!! I am working on getting the Target Debit RedCard too! I have already bought 3 Christmas gifts for my daughter (3 Lalaloopsy double Workshop packs- originally $24.99 EACH) for FREE with all these savings. Seriously- why did I ever waster time at other stores? A HUGE HUGE HUGE thank you to you Kerry for all the time you put into this site. I check this site all day long and you save my family soooo much. During this Thanksgiving season our family will pray for many, many blessings to be showered upon you and your family! We are so thankful for you! Wohoo. Was So Excited To See This Yesterday. I Did My First Cartwheel Transaction This Morning To Get Battleship. I have used Cartwheel a lot and started using mobile after printing it off (no smart phone). Had no problem until today. None of my Target coupons came off- no printed, no cartwheel, no mobile. My manufact. coupons worked fine. Wonder how that happened? I have a question, I to do not have FB, so I signed up through email, I printed the bar code with the things I wanted on it, when do I give it to the cashier? Do I hand them the $10.00 off coupon first, then cartwheel, then other coupons? I’m so happy that I could finally get in on the cartwheel deals, just not sure how to use it. Thank you so much Kerry, can’t wait to start using the cartwheel. Thank you for all you do. I was never a Target shopper until I found your site 2 1/2 years ago, now Target my favorite store. Thank you again. awww 🙂 TY Terrie- I am happy for people too! I know many people don’t use fb so it’s awesome that they now have this option! Oops – apparently after reading the posts we aren’t the only two on the planet not on facebook! So excited for this new email option!!! Not a Facebook user and always so jealous of the deals I was missing out on. mazel tov – GREAT news! so excited it is offered without fb! my hubby put it on his fb for the halloween costume discounts and has been trying to convince me ever since to set up fb so i can get my own cartwheel!! I have some cartwheel questions but am not sure who can answer these since signing up by email is so new. First question- can I only load 10 cartwheel offers at a time? Second question- if I take my printed out list of cartwheel deals to the store, do I have to redeem all the cartwheel offers on the list at the same time? Do you know how long this testing will take? It has been going on for while now and I don’t want to miss out on any more savings.